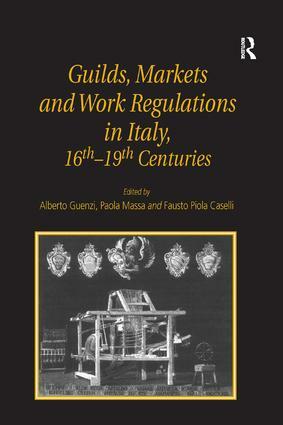 The purpose of this volume is to provide a conspectus of current research on the history of guilds and corporations in Italy in the period from the Renaissance to the end of the 19th century. Particular aims are to examine the relationship between guilds, manufacturing, entrepreneurship, and economic development, and their impact on urban society and social welfare. The work derives from a major project set up in 1994; the results were discussed at a conference in Rome in September 1997, and formed the basis for a further presentation by Professor Carlo Poni at the 12th International Economic History Conference in Seville. The papers are grouped into three sections, dealing with the guild system in urban areas, case studies of individual guilds and conflicts, and their role in mutual aid and assistance. Specially translated for this volume, they trace for the English-speaking world a rich picture of the history of the Italian guild system in the modern era, and its movement from magnificence to decline.